A great win for Joe Kiely in Round 2 of the BC Cyclo-cross series. 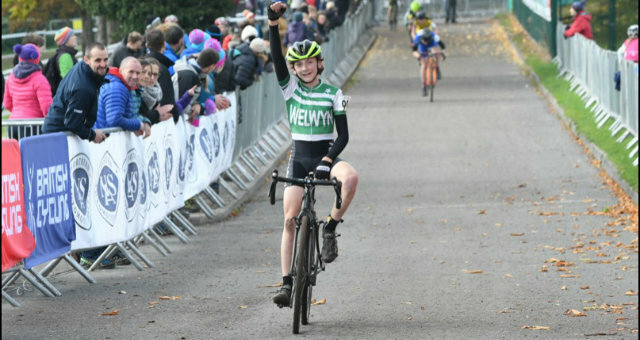 Six club riders travelled to Abergaveny for Round 2 of the BC cyclo-cross series – Joe Kiely put up a superb performance to win the Under 14 boys race by 30 seconds from a field of 42 riders. A great ride and his best race of the year. This time he made sure he was on the podium after just missing out in Round 1 at Derby where he finished 4th. Elspeth Grace was 7th in the Elite Womens race and second Junior while Oliver Stockwell was 7th in the under 16 boys race. On Saturday twenty one of the club riders competed in the Central League CX event at Milton Keynes – Finlay Woodliffe/Rupert Cavill/Dillon Knott dominated the under 10 race with a 1,2,3 result in the field of 29 riders. Ed Ungers and Xavier Knott 3rd and 4th in the under 8 race. Thomas Dixon was the best placed of the four Wheelers in the under 12 event in 8th spot. Beth Bennett 18th, Harry Eagle 19th and Poppy Knott 20th. Both Joe Kiely and Oli Stockwell decided to ride the Central League event on Saturday as a warm up for the BC National race at Abergaveny race the next day and won the under 14 and under 16 races respectively. Other good performances – Euan Woodlife 3rd in the under 14 boys with Michael Sumner 6th. Joe Bennett 4th in the under 16 boys and Ellen Bennett 3rd under 14 girls. Naomi Holt and Freya Butler were top two in the under 16 girls race. The Eastern CX event was held at Mistley near Ipswich on Sunday – Dylan Starkey 2nd in the under 12 race – Tom Martin 3rd under 16 and Martin Dossett 27th in the 40+ race. There were a number of Open Hill Climb events in the Peak District at the weekend and Wheelers rider Jamie Deane notched up two wins in the youth section of the events.